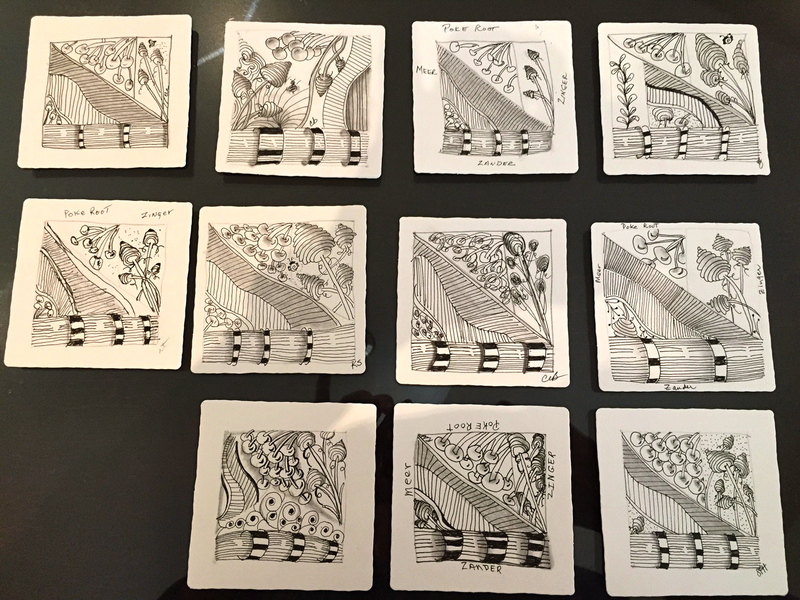 Last weekend, I had the opportunity to teach Zentangle to a group of eleven ladies who gather once a month for miscellaneous crafting activities. One of them, Carol, had taken a class from me at Paper Tales and subsequently invited me to come speak to her group. These ladies know how to have fun. We started at 10:00am, gave the history of Zentangle, shared some stories and then we made our first tile. Then, we had to break for lunch. They go all out … quiches, salads, drinks and dessert! After lunch I taught them four more patterns so we could complete our second tile. Because this was going to be a three hour class, I also prepared an extra tile that I had washed with water colors in pinks and reds. I then outlined a heart and gave one to each lady. I asked them to draw a string inside their heart and then fill in with the patterns they learned that morning. It was great. And, by this tile, they were all so quiet while putting down their patterns. They finally got it! I had a great time and hope some of them will continue on their Zentangle journey. Thanks to Carol and Karen for hosting this fun day of creating! ← Challenge #201 … Moebius Syndrome Awareness Day!